After sorting out which Starbucks to meet at on Tatum Road in Northern Phoenix, Jennifer Samuels enthusiastically relayed why she wants to become one of the Democratic nominees for one of the LD 15 State House Seats in August and ride the Red for Ed Wave to victory in November where she can promote a forward-looking agenda. LD 15 includes parts or all of Peoria, Phoenix, Cave Creek, Paradise Valley, and Deer Valley. A Democrat has not recently won in this district and Mrs. Samuels is hoping, with her ideas and supporters, to change that and win this November after winning a slot in the Democratic primary this August. If she wins in the August primary, her two likely Republican opponents will be conservative advocates State Senator Nancy Barto and House Majority Leader John Allen, two reactionaries who, according to Mrs. Samuels, have lost touch with the people in their district, and who feel it is appropriate to sell firearms without background checks, to intrude on a woman’s privacy if she is exercising her right to choose, and to hinder the democratic process by making it harder to put ballot initiatives up for a vote. 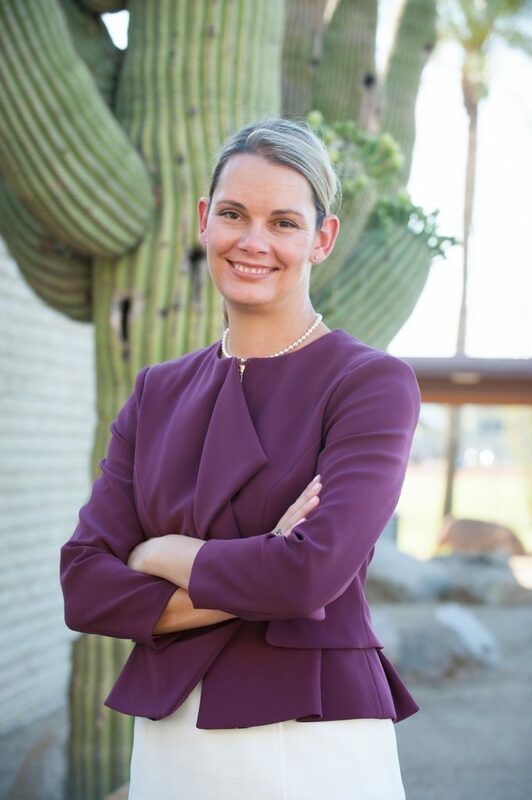 Mrs. Samuels feels she can be a better advocate for the people in LD 15 and is running on a pragmatic problem-solving agenda that emphasizes education, school safety, and the economy. These experiences, along with her perceptions of how the current District 15 representation blindly follows the Republican Party line, have shaped her approach to governing by pursuing a bipartisan work across the aisle posture; always willing to listen and negotiate a compromise to move legislation and the state forward for the benefit of the people they serve. Feeling local decisions at the state level have more impact on people than national mandates, she sees herself as an effective leader who will treat each issue on its merits and adopt a progressive, moderate, or conservative position depending on the situation at the time. She is a wife and mother of three daughters. The pivotal goal for Mrs. Samuels in this election is education. Without fully funding education and investing in children, everyone in the state suffers. Children suffer because they are not adequately prepared for college and careers. Our economy suffers because we do not have a well-trained workforce that will appeal to major corporations that we want to relocate operations and their high paying positions to the state. Mrs. Samuels asserts, like all the other profiled (by this Blog) Democrats running for office, that a quality well-funded school system, rather than low corporate tax rates, is the major drawing factor businesses consider when settling in communities. Providing Universal Pre Kindergarten for everyone so all children will be on the same level when they start kindergarten. Learning standards developed by educators and experts. A 20-to-1 student to teacher ratio for K through third grades with slightly higher-class sizes for the older grades. Modernizing our schools where features like movable walls are removed for safety and acoustic reasons. A conversation among all stakeholders on how to make our schools safer. Reducing the school counselor to student ratio from the current 941-to-1 to 250-to-1. Career Pathway and Apprenticeship opportunities at all high schools and not just centralized locations like E.V.I.T. (East Valley Institute of Technology) and Metro Tech so students not planning to attend a university program will be prepared for vocations after they graduate high school. Early college opportunities for qualifying students so they can get a head start in college. The state or district would subsidize the tuition. Greater funding and smaller classes for special needs and better compensation for the classified staff that assists in this area. No vouchers until public schools are fully funded. Greater accountability and transparency for charter schools. No state funds for the Koch-sponsored Freedom Schools at Arizona State University or the University of Arizona. Reduced In-State Tuition for University Students, including Dreamers. Fully funding public schools by helping pass the Invest in Ed Ballot Initiative at the ballot along with raising taxes on the wealthy and instituting a one-cent sales tax. By pursuing these ideas and programs, Mrs. Samuels feels our public education system will better serve children and become a beacon for businesses, providing openings for highly qualified workers in highly paid positions, to come and start in Arizona, thus providing a vital economic stimulus to the state. Health Care costs have risen for everyone while wages have either been flat or hardly increased. Mrs. Samuels supports quality and affordable health care options for everyone including allowing people the choice to buy medical insurance through the State Medicaid Program. She is strongly in favor of raising the minimum wage to a level that people can live on. $12.00 an hour is not enough to live on in her district. She favors universal background checks, mandatory waiting periods, and an updated database. Furthermore, she favors laws requiring the securing of weapons at home and the workplace. She is appalled by the inaction of the State Legislature in this area, especially as this pertains to school safety. A Clean Elections Candidate, Mrs. Samuels is appalled that Arizona is among the state leaders in Dark Money receipts and is fully supportive of the Outlaw Dirty Money Initiative, saying, “We want to know who is donating to our candidates and elected officials.” She chastises her opponents who blindly follow their parties’ leadership and sponsors in not following the will of the people who want this information published. She fully supports and favors investing in science and technologies that develop clean energy options that protect our water supply and air like solar energy. High Speed and Light Rail: She favors its expansion within Phoenix and the suburbs as well as the investment in a high-speed rail line that would connect Tucson to Phoenix to Flagstaff to Las Vegas. She believes this would be a great way to protect the environment and relieve traffic congestion like the I 17 route from Deer Valley to Flagstaff. It would also create many high paying construction jobs. Broadband: Make sure it is continually updated and investments in cybersecurity and cyber maintenance are increased so any threats can be met. Water Conservation: As the Phoenix area and Arizona grows, we need to enlist the advice of experts who can recommend ways to conserve and maintain our water supply and storage. Believing in the motto “An ounce of prevention is better than a pound of cure,” she believes that investing in interventions in the education sphere (more counselors and social workers), the potential poor behavior will be identified in time to prevent bad acts and poor choices. She feels that spending money on education equal to what we spend on prisoners will be one of the best ways to reduce the incarceration rate and provide a safer community. She thinks additional investing in border security, including a wall is “absurd” and a “waste of money,” contending that the funds allocated to that area are better served in funding education and healthcare. A pathway to citizenship needs to be found for people who are here illegally but have broken no other laws while here. She blames President Trump for raising the fear level in this community where common sense solutions (making them pay a penalty/tax while going to the back of the citizenship line) are readily available that the President and his devoted supporters are not receptive to. She attributes this war on Democracy (making the ballot initiative process harder and reducing early voting opportunities) on the Republican realization that they are losing the demographic race (as well as the battle for ideas) and these draconian steps to restrain the will of the majority are the last gasp to maintain control. Totally supports and has participated in helping sponsor a Gay and Straight Alliance Club at her school that meets every Friday during the school year. Mrs. Samuels is very grateful for the teachers and the pro-education community members who are supporting her campaign. She was able to get the required signatures to appear on the primary ballot in just 17 days. She is “highly networked” with the LD 15 office, which has seen a surge in volunteer participation from 30 to 90 thanks to the election and actions of President Trump, the Me Too Movement, The Women’s March, the Red for Ed Movement, and the out of touch reactionary policies of Governor Ducey and the Republican-controlled State Legislature. Launching a grassroots campaign comprised of door knocking and extensive social media outreach, she feels her candidacy as the only educator running in the district and her ideas will propel her to victory in November. She is a candidate voters should research and consider when deciding whom to vote for. For more information on Mrs. Samuels, LD 15, and her opponents, please access the website links below.